As both a lightweight game and an accurate portrayal of the courtship process, Love Letter is an exemplary work. I often feel that “filler games” aren’t subjected to the same level of analysis and thought that many heavier games like Twilight Struggle or even Pandemic are. That’s a missed opportunity if I ever saw one! 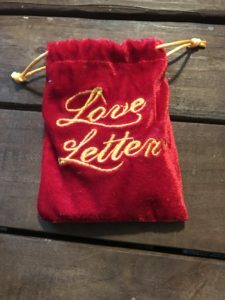 Love Letter is the kind of game that you can play while waiting for stragglers to show up at your game night or to give your uninitiated family a taste of board game culture. It’s the sort of game you can get your arms around in five minutes and understand the deeper elements of in twenty. 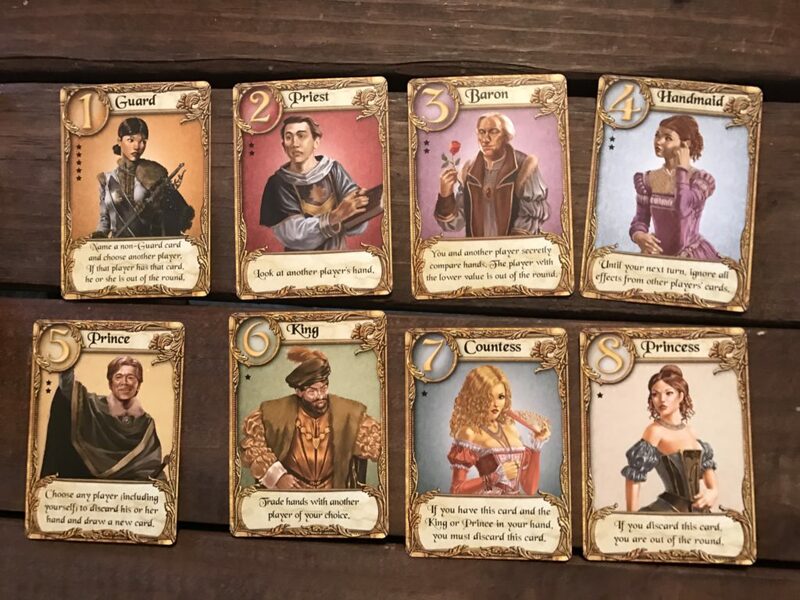 Love Letter is really simple at heart – win the game by winning the most rounds, win the rounds by having the card with the highest value in your hand at the end of the round OR by eliminating everyone else. Everybody holds one card in their hand. When it’s your turn, you draw a second card. You choose which card to keep and which card to play. Each card has a unique effect and there are eight types of cards. Though it’s super easy to pick up, the game turns into a slightly heady mix of deduction, risk mitigation, and probabilistic thinking. All the strategy fundamentally comes down to a single principle of game design that became apparent to me after a few rounds. The eight types of cards are elegantly balanced by short-term vs. long-term value. Guard. Name a non-Guard card and choose another player. If that player has that card, he or she is out of the round. Priest. Look at another player’s hand. Baron. You and another player secretly compare hands. The player with the lower value is out of the round. Handmaid. Until your next turn, ignore all effects from other players’ cards. Prince. Choose any player (including yourself) to discard his or her hand and draw a new card. King. Trade hands with another player of your choice. Countess. If you have this card and the King or Prince in your hand, you must discard this card. Princess. If you discard this card, you are out of the round. The higher your card’s value, the higher your probability of winning the round – a long-term benefit. The lower your card’s value, the higher your probability of hurting other players – a short-term benefit. It’s a very simple trade-off, but one that takes careful thought to manage. I’ll break it down further. Guard. If you know what someone is holding in their hand, you can knock them right out of the round. Boom. The odds that you’ll know at least one person’s hand are pretty high. However, if you’re holding this at the end of the round, you’re almost certain to lose. Priest. Information is a valuable currency in this game. This lets you peek at someone’s hand, giving you a chance to maximize the use of the Guard or Baron cards to knock someone out. Baron. Play this when you’ve got a high card in your hand and you knock someone out. It’s a little risky, though. Handmaid. Thwart someone’s strategy – purely defensive, but pretty useful. Prince. If you know someone is holding a high card, this can be a really useful play, but you won’t get many chances to use it in practice. King. The only reason to use this card at all is if you’re going to get the Countess or Princess out of the deal, which is fairly unlikely. Otherwise, you’re better off holding onto the King. Countess. This card almost assures you victory if you can hold onto it, but its effect is a liability since it can force you to discard a great card for a lesser one! Princess. This card wins you the game if you survive to the end of the round, but its effect is a liability. One false move and it’s over for you! At a price point of $10 on Amazon, this game is worth your attention! This game is excellent for teaching one of the fundamental lessons of game design balance: developing a trade-off. If you’re a designer, buy this and a few other games like it. It’s through studying simplicity that we can create elegant complexity. What is the board game community?